Preheat a large skillet over high heat. Pat each pork chop dry with a paper towel and season generously with salt and pepper on both sides. Add 2 tablespoon olive oil and 1 tablespoon butter to the pan, when butter just begins to bubble add two pork chops. Sear on high for 4 to 5 minutes on each side. Transfer pork chops to a clean plate and cover loosely with foil. Repeat for last 2 pork chops. Return skillet to low heat; add 4 tablespoons butter, Dijon mustard, heavy cream, and garlic; whisk continuously until smooth and garlic is softened. Season with pinch of sea salt and stir in 2 tablespoons chopped parsley. 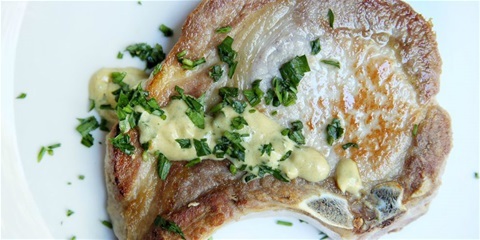 Serve pork chops with drizzle of creamy Dijon sauce and top with remaining parsley and sprinkle of sea salt.